Named for one of the Smoky's most unique plants - MOUNTAIN LAUREL is as authentic as its namesake. This mountain log cabin combines the luxuries of home with real mountain living! Located half way between downtown and the famous Ober Gatlinburg Ski Resort - MOUNTAIN LAUREL is convenient to town and the Great Smoky Mountain National Park. Enter from paved parking into a vaulted living area with sleeper sofa and LED TV. The main floor KING bedroom includes a stone accented in-room Jacuzzi for two, and an outside deck complete with bubbling hot tub! The in-room stone / gas fireplace offers guests and extra touch of romance! 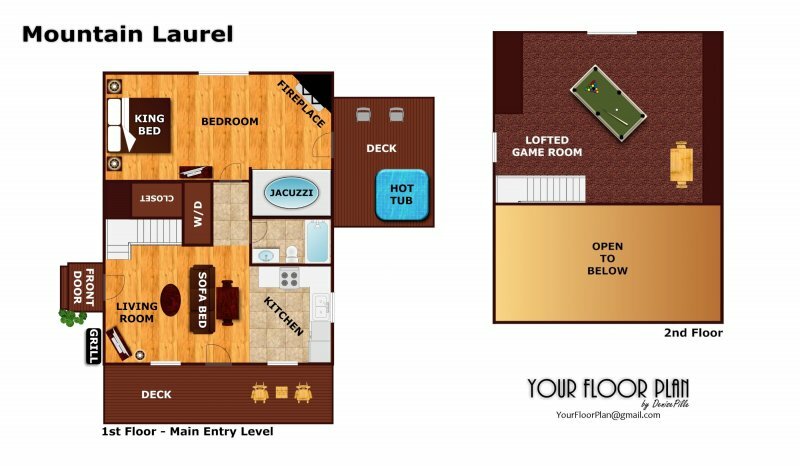 Upstairs a game loft with billiards table makes staying-in fun! Grill out & dine-in, or go out for a night on the town in Gatlinburg. With MOUNTAIN LAUREL as a home base, you don't even have to plan ahead! Call today and plan your next Smoky Mountain Getaway in MOUNTAIN LAUREL. Beautiful cabin and very clean!! We came out for a wedding & loved our cabin. It was easy to get to, somewhat secluded & perfect for us! If we ever come back put this way, we will definitely go through American Patriot again! Loved our cabin and experience!!! We will be returning next yr!! One of the best places Ive ever stayed, the week before holiday was a great price. Loved it loved it loved it. I would Highly recommend this cabin. The cabin was immaculately clean. The cabin was cozy. Loved it yaas yaas hunty. We loved the cabin, it was the perfect size for us. We'll use APG when we come up to Gatlinburg later this year. Had a wonderful time, it was great. Have never stayed that close to the park before. Have been coming for years, always wanting to see a bear in the wild (from safe distance).Didn't actually see one but, my neighbors did. It was quite evident that they arethere as the neighbors also saw a bear eating the trash can on our porch while we were out.Would love to stay in a deluxe or luxury cabin in this area again. The young lady who booked our cabin (Can't remember her name)was really, really nice. Really enjoyed speaking with her and she was extremely helpful. Thanks so Much, we really had a good time.In all my years of visiting I've only stayed with another company 3 times. It goes without saying that American Patriot Getaways wins the prize hands down. My future wife and I hope to purchase or have a cabin built in the future and will need someone to work with. APG / you will be the first company we call. Only one minor issue (remote for TV did not work). The one in the bedroom also worked for the one in the living room but I didn't immediately figure that out. Otherwise, the cabin was very nice and very clean. Had a wonderful time. Loved the stay! If you have any larger cabins ( 5 bedrooms or more) available over Thanksgiving, please let me know.